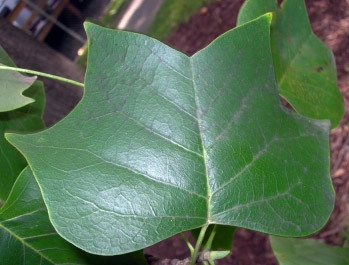 Liriodendron Tulipifera Fastigiatum is a medium sized, deciduous, pollution tolerant, compact form of tulip tree with a columnar habit and considered to be highly ornamental making it suitable for public parks. Due to its columnar shape, this makes it suitable for roadside planting. One of the features of the tree is that the leaves are missing a toe, which is an easier way of saying the apex is absent from the tip of the leaf and actually points inwards. The leaves have four lobes or toes and unfold like a book in the Spring. It seems the more spectacular a flower, the longer you have to wait for it. Using that reasoning, these must be amazing as they can take from 7 years to make an appearance (must be female) although some estimates state 20 years. This age is taken from day one, our tulip trees are supplied at around the three year point or more. The flowers are tulip shaped and a green/yellow colour with bands of red and orange on the outside petals and come out in early Summer. Apparently the Liriodendron Tulipifera Fastigiatum is a little bit of a non-conformist in the Autumn. The leaves turn yellow before turning brown. At the 10 year point the tree will be 10 years old.....ok, just checking you are awake. On its tenth birthday, it will be around 6 metres tall but could go on to be much taller than that dependant upon local weather and soil conditions. Heights of 20 metres are common with a 5 metre spread. We know how much you green fingered lot like to go out and tend to your garden children. To touch them is to love them, to touch them more is to love them more or other such philosophies however this tree will not thank you for it. Basically plant it and forget it in pruning terms. Only take out dead, diseased or crossing over branches. A well draining site will give you much better results with acidic soil although the tree is chalk and clay tolerant. Full sun preferred with a sheltered site if possible. Try for a deep, moist loam especially for the early years but as it becomes established it will be drought tolerant. Ideal conditions will give you a moderate to fast growth rate. Average growth is around 30cm a year but juvenile growth (the first 10 years) can be much more. Considered to be fully UK frost hardy. 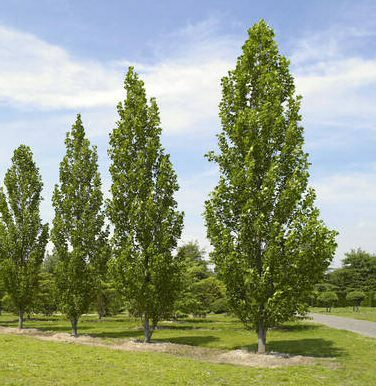 This tree is supplied at a height of between 1.8 and 2.20 metres in a 10-20 litre container for year round planting and better results than from either bare-root or rootballed stock. This section used to be Brigadier Tulip Information but since being upgraded, we now call it General Tuplip Tree Information! Tulip trees are long lived (up to 300 years), very ornamental and will tolerate urban pollution well making them very suitable for parks and urban planting. Tulip trees with an upright shape are suitable for roadside planting. Usually a medium to large tree meaning they will grow to around 6m at 10 years. They could go on to grow much more but this is dependant upon local weather and soil conditions. Heights of over 50m have been recorded. 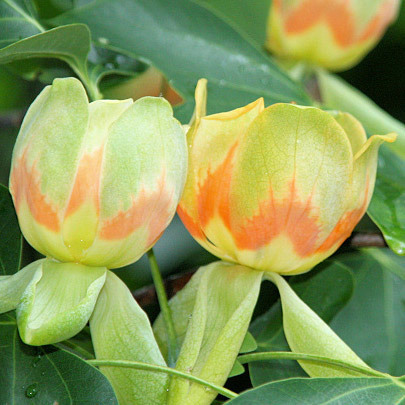 Most Tulip trees prefer a well draining site, will tolerate chalk but prefer acidic soil. For those really into Tulip trees, you maybe interested to know that they are part of the Magnolia family. We are not sure if it was adopted or if there was some sordid affair between a Tulip and Magnolia many years ago. The flowers are a rich source of nectar and will attract bees to your garden. Any fruits produced will last long into the winter. A hardwood tree with many uses because of its height and long length of clear trunk. The wood is light, straight grained, resists splitting and was the "tree of choice" for Native Americans to make canoes. Useful as a shade tree because of its size and dense canopy. 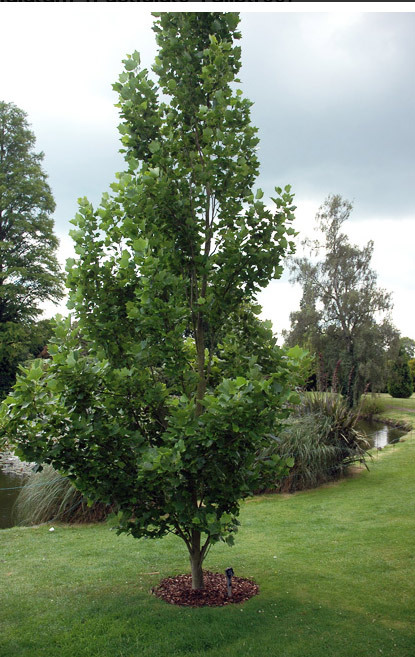 Younger Tulip trees can be fast growing reaching 30-100cm growth a year.